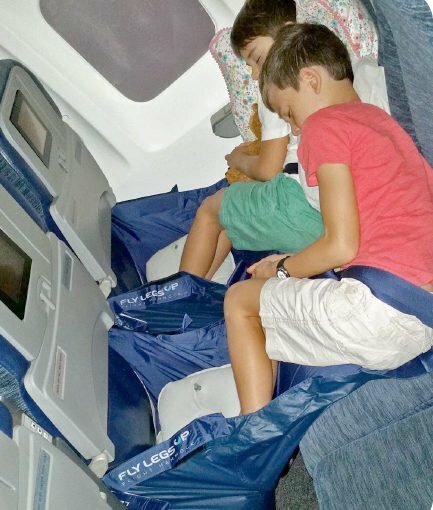 Every year, we get numerous emails asking for advice about family travel products that make those long road trips or cross-country flights to visit relatives and friends a little easier. It’s no secret that traveling with children is challenging. 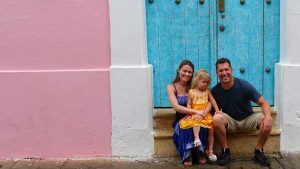 We’ve written several posts on surviving road trips, flights with a baby, and flights with a toddler. But often, it’s what you bring with you when you travel that makes the biggest difference. 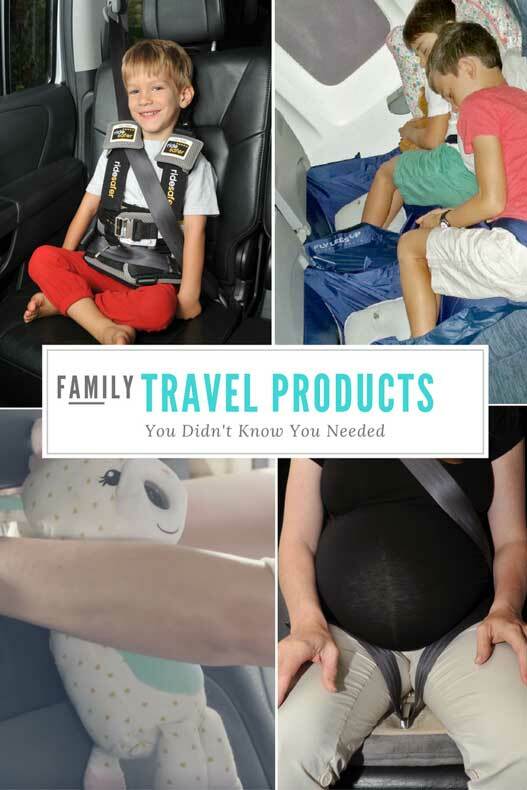 While there are plenty of travel products out there that make family travel easier and safer, here are ten you probably didn’t know you needed. The zooby Car and Home video baby monitor is the most portable monitor on the market. It’s a must-have for traveling parents. You can keep an eye on your rear-facing baby in the car during a long road trip, or use it in hotel suites or at a relatives house to monitor your sleeping baby from another room. The wireless monitor includes night vision, rechargeable batteries, and all accessories necessary to use anywhere you go. The monitor’s camera is conveniently placed in the nose of a plush animal, so your little one will adore it! I absolutely HATE lugging my daughter’s car seat through the airport. But checking it through to our destination is equally annoying because it never fails, the car seat ends up beat up and even missing pieces when it arrives. That’s never good when we’re talking about a life-saving device for my daughter. Renting a car seat from a rental car company isn’t a great solution either because they’re seats are usually gross and dirty, and come with an added expense. 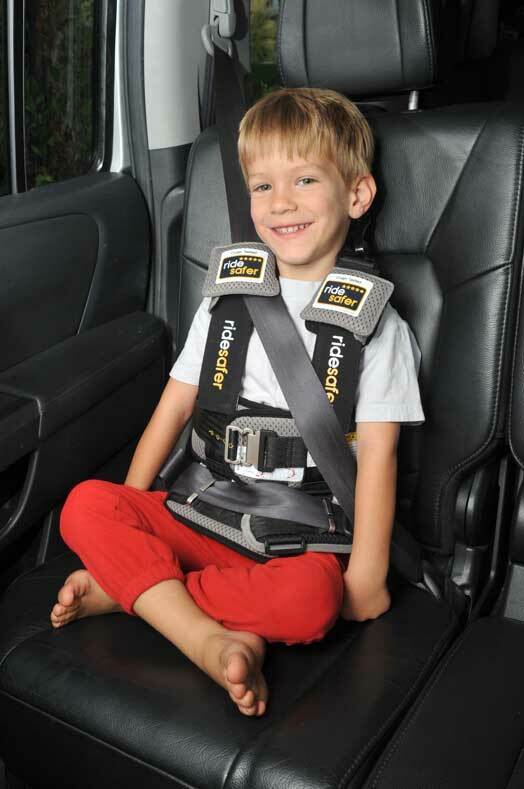 The RideSafer wearable car seat vest is an alternative to the traditional booster seat or a more portable version of the forward-facing, 5-point harness seat. It’s lightweight and easy to travel with. The vest meets the same safety standard as a traditional car seat and is made to fit children from 3-years-old and up. If you are planning on renting a car seat from a rental car company, you’ll definitely want to give it a good wipe down. Chemical-free Cleaning Stroller & Car Seat Cloths from Baby Care by e-cloth® remove over 99% of bacteria from Strollers and Car Seats using just water and a cloth. Absolutely no chemicals, which is so important to me! Even better it is reusable and guaranteed for 300 machine washes. I’ll admit was one of those moms who was worried about giving my daughter a blanket when she was little. But the Muslin Security Blanket by MiracleWare is perfect for parents like me who want their little one to have a comfort item, but are anxious about giving an infant a blanket. It’s small, soft and durable making it perfect for travel! And when you are on the road as much as we are, a comfort item is a must to help your children feel more at home in a strange place. Our daughter got attached to a comfort item at a very young age, and we never leave home without it. 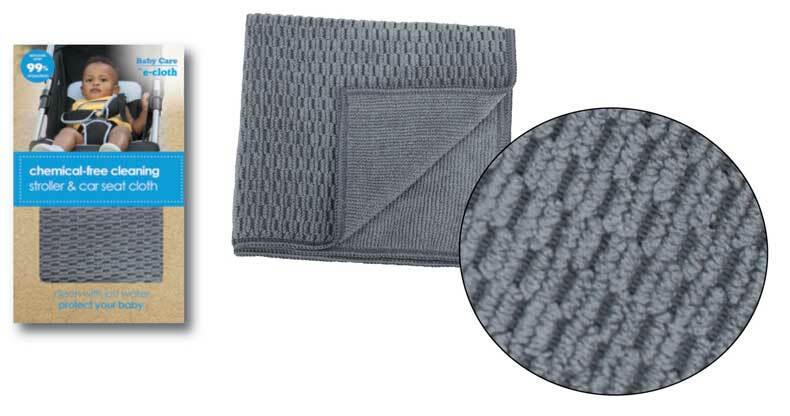 These particular security blankets come in packs of two, so if one gets dirty, you always have a spare! Score! Feeding your baby on-the-go can be a messy experience. But I’ve found there are definitely ways to make it easier. The Silicone Feeding Spoon makes those car seat feedings on long road trips way more convenient! The silicone containers hold up to 3 ounces of baby food and dispense one bite at a time. 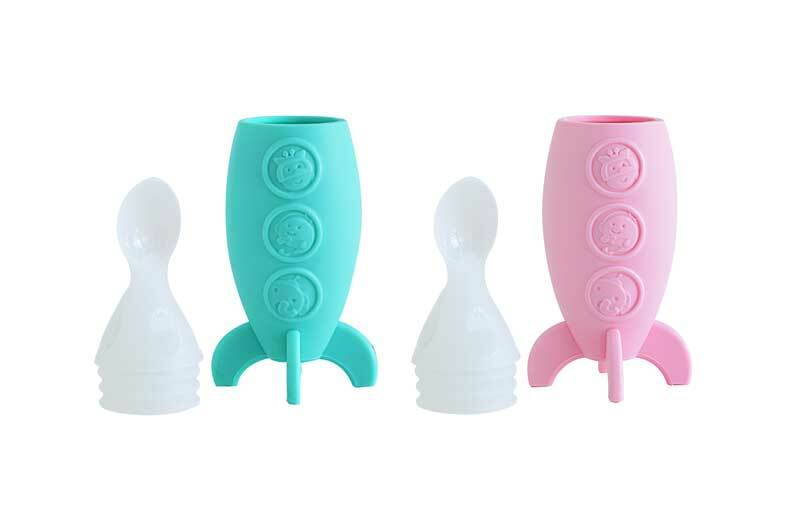 Their BPA-free, PVC-free and phthalate-free so no worries about nasty chemicals seeping into your little ones food. You can safely warm them directly with hot water or a microwave oven, and the hygienic stand up base allows the dispensing spoon to stay upright and not touch surfaces.This is great for restaurants, as well. The Fly LegsUp hammock is great for short people like me or for kids. It’s never easy to get comfortable on a plane, but when your legs don’t even reach the floor it’s even worse. The Fly LegsUp hammock provides leg support at variable heights, by adding or removing and changing the inflation levels of the pillows. It is very adaptable and can make a flat platform for young kids to sleep and play on. If you’re pregnant, this is a product you should invest in before any road trip. In the US alone there are more than 10.8 million car crashes a year. If you are one of those unfortunate victims involved in an accident, a traditional seat belt may save your life, but could harm your unborn baby. The Tummy Shield™ is the ONLY pregnancy seat belt that protects an unborn baby in the event of a crash effectively redirecting the seat belt away from the pregnant belly. It secures the seat belt at the legs, not the belly or hips, which also makes it great for those new mamas recovering from a C-section or anyone else who has recently undergone abdominal surgery. The crash-tested design ensures the belt stays firmly in place without any slippage or dangerous slack. It’s a glove and a sack all in one! 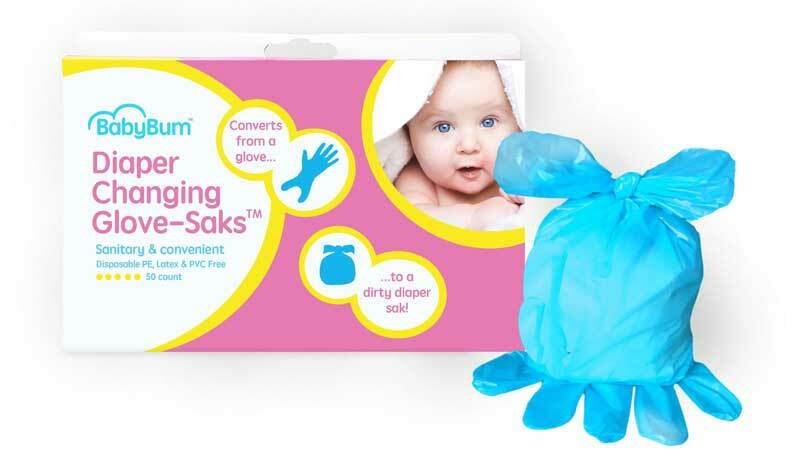 The Diaper Changing Glove-Saks™ from BabyBum Products are perfect for when you’re on the road. They keep your hands clean and germ free while changing your little one’s dirty diaper and easily converts from a glove to a dirty diaper sack. Smells stay contained until you arrive at your destination (or a gas station with a trash can) where you can toss it. They come in packs of 50 so they’ll last the entire trip. 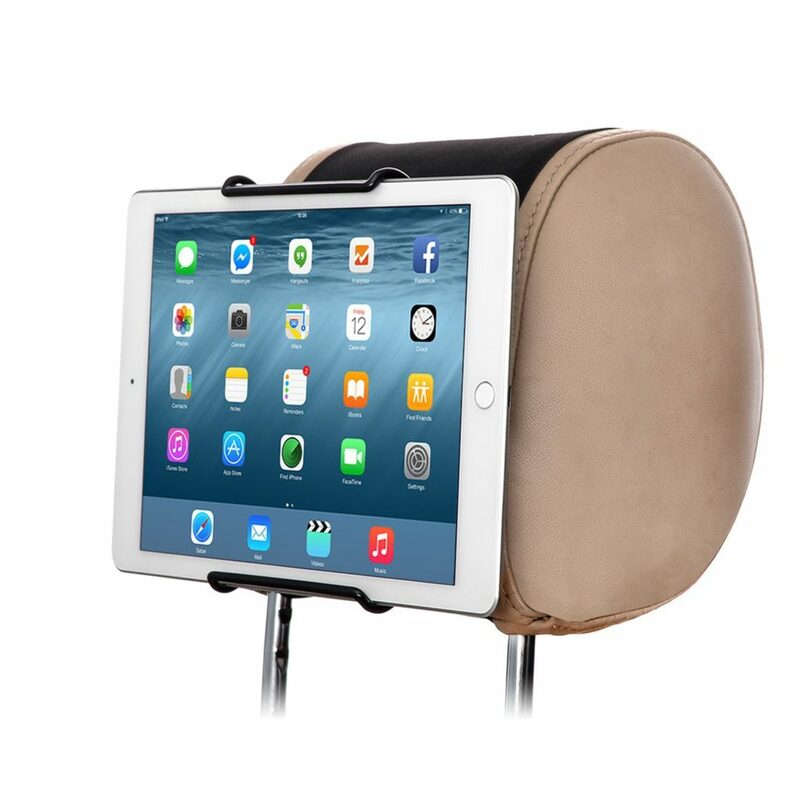 Long road trips with kids will be much easier with the Tablet Headrest Mount. The mount straps securely around the headrest of the front seats (or the backseats for rear-facing children). The mount works well with all iPad & Samsung Tablets and other 7 inch – 11 inch Tablets. The adjustable strap allows for easy, quick and secure mounting to any car headrest or even the seat back tray table in an airplane. It’s portable, easy to store and to install. 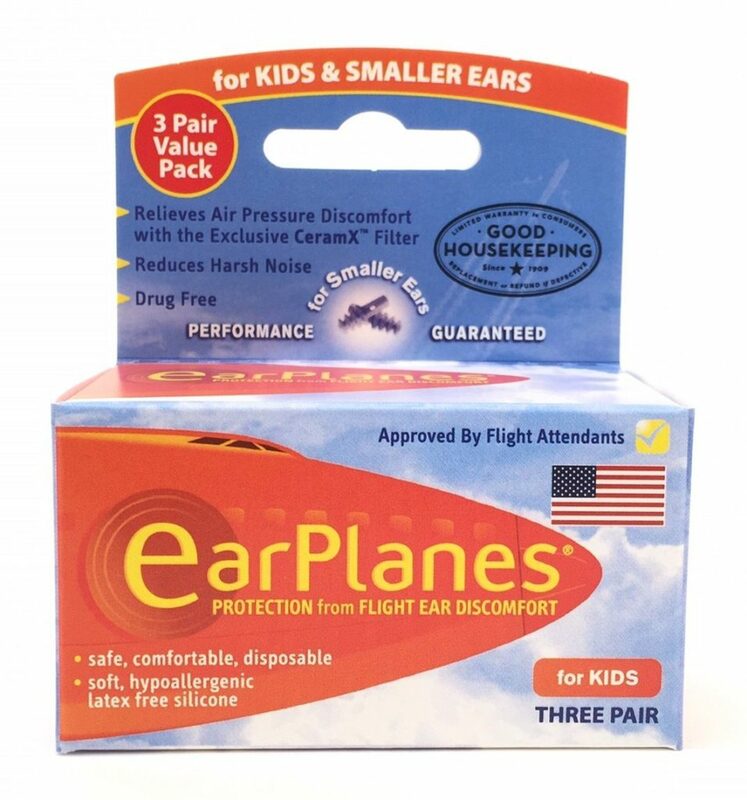 Flying with a little one and worried about the pressure causing their ears to hurt? Earplanes relieve inflight ear discomfort by regulating air pressure and reducing harsh noise. I first heard about Earplanes from our daughter’s pediatrician. These soft, disposable earplugs are safe for children over the age of one. Each pair is good for the flight to your destination and back. What are your must have family travel products? Drop us a comment below! Lol, you´re right! I didn’t know I needed these things and probably still don’t as I don’t have children. But I have a friend who is a new mum and loves to travel and she is going to love this. Will pass it on. I wonder if they do earplanes for adults? They do make earplanes for adults. However, since most adults can tolerate the pressure change better than kids, they are definitely more popular for little ones. Okay, the Fly Legs Up thing is brilliant. I wish they had such a product for adults! It is for adults too! The inflatable pillow removes to make a leg hammock for adults. I wonder if people would look at me strangely if I got the Legs Up Canopy for myself? I need some tips for myself to sleep on a plane! I love the tablet headrest mount, what a great item for road trips. Surely the kids can’t ever be bored with that! Haha and the fly legs up canopy looks comfy, I’ve never seen that before. That headrest mount keeps my daughter entertained. I don’t know what we would do without it. I don’t have children but I can see the value in every single one of the products you have chosen. I would go for the ipad holder, I can never get it to stand the way i want it when I’m traveling and feel like watching a movie. I don’t have little ones, but I think some of these things could be brilliant for adults as well! Where do I get my own Fly Legs Up?! Yes! I thought the same thing. It’s great for taxi rides. Even if you live in a big city like NYC and use taxis a lot, it would be perfect. Well, I have no children and don’t have to worry about these products yet. But my best friend, who was my travel partner for the last ten years, is having a baby some time between now and Friday. So I’ll definitely save this information on her behalf! Congrats to your friend! My bestie and I traveled together a lot before kids, too. She now lives halfway around the world, so safe to say we don’t travel together much anymore. But I hope your friend continues traveling even with a little one! I really think the Tummy Shield will become a safety standard in the future. I can’t believe it isn’t already actually.